Imagine San Luis Obispo without the historic Fremont Theater. Imagine Monterey Street without that soaring art deco marquee. The stately theater could have been razed a couple of decades ago to make way for a multiplex. It could have been fundamentally changed by dividing its cavernous auditorium into two theaters—another cockamamie proposal from the past. In a desperate attempt to keep it in the movie business, it almost had an IMAX theater tacked onto the back of it on Higuera Street. 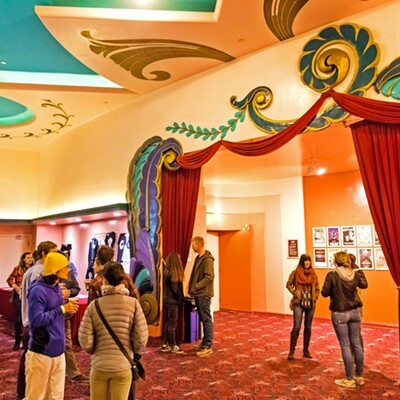 Instead, the Fremont Theater will remain the statuesque beauty it was designed to be and return to its original intent as a multi-use venue capable of hosting concerts, films, and special events—all thanks to the Fremont Theater Entertainment Group, LLC, which began quietly operating the theater nearly 14 months ago. The Fremont Theater was one of the last Streamline Moderne theaters designed by architect S. Charles Lee, who also designed the Los Angeles Theatre, the Max Factor Building, and the Hollywood & Western Building. GRAND DAME Fremont Theater's soaring marquee is an iconic part of Monterey Street, and looks much like it did when the theater opened on Memorial Day 1942. On Memorial Day 1942, the Fremont opened its doors with a celebrity-filled evening featuring attendees such as comedy duo Stan Laurel and Oliver Hardy, boxer Max Baer, and child star Jackie Cooper (who offered to kiss women who invested $100 in war bonds). That evening's film was the romantic war drama, This Above All, about aristocratic Prudence Cathaway (Joan Fontaine), who joins the WAAFs and takes up with AWOL soldier Clive Briggs (Tyrone Powers). 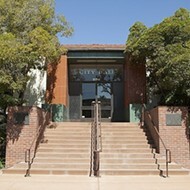 In addition to celebrities who traveled from Hollywood specifically for the opening, the auditorium was filled with servicemen from Camp San Luis Obispo and Camp Roberts, men who were training to enter the war and would soon be shipped overseas. 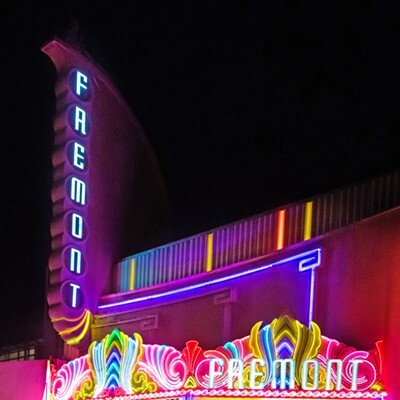 The Fremont hosted a lot of concerts in its early days and continued to screen movies, eventually settling into strictly a movie theater. By the '80s, however, the movie theater business began to change. Single-screen theaters were becoming a thing of the past, and the Fremont Theater was losing viability, which is when thoughts of razing it came into play. Luckily, the community wouldn't hear of it, and soon the Mission Theaters, since closed, were built next door to add three screens. By the early 2010s, even that wasn't enough to make it profitable. About the only time a film could muster a full house was a major event like a Star Wars sequel. Trying to find 800-plus people who want to see the same film at the same time is nearly impossible today. What would eventually become the Fremont's future was the slow and intermittent return of live music to the venue. Bruce Howard, who at the time co-owned Cambria radio station KOTR 94.9FM (now KPYG), hosted shows in the Fremont such as Steel Pulse, Yellowman, Toots and the Maytals, Los Lobos on their Kiko tour, John Hiatt, and the famed March 1996 reunion shows of progressive rock band Yes, which recorded and videotaped live in the Fremont for their Keys to Ascension double albums and live concert video. Those early shows gave Howard, who spearheaded the new Fremont consortium, an idea of exactly what it would take to make the theater into a truly successful concert venue. Now more than three decades later, it's actually happened. 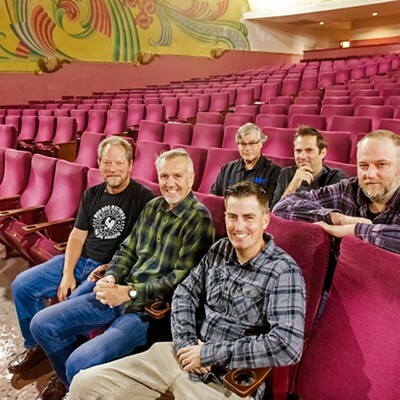 PARTNERS IN RHYME Music industry insiders (front row, left to right) Bruce Howard, JG King, Thomas Cussins, (second row, left to right) Bill Gaines, Taylor Stevens, and Dan Sheehan are The Fremont Entertainment Group, LLC, which now operates the Fremont Theater. 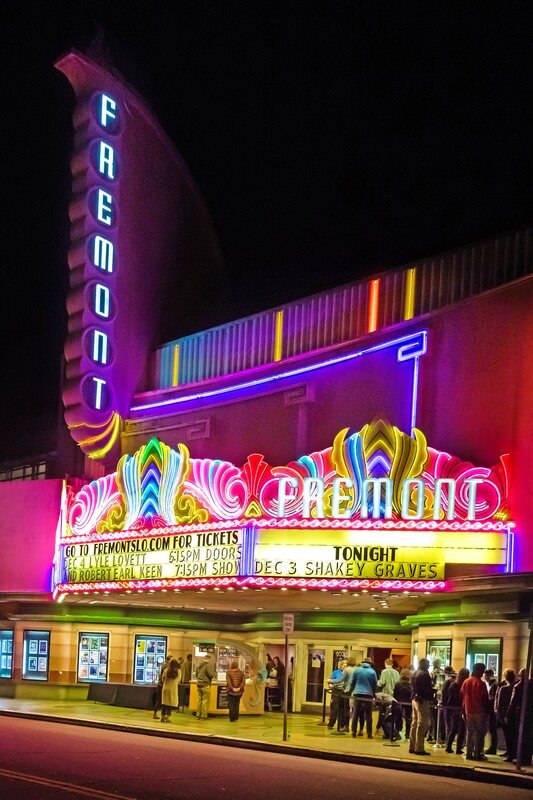 The Fremont Theater Entertainment Group, LLC, is a partnership between concert promoters Howard (Otter Productions, Inc.), Taylor Stevens (formerly of Collective Efforts but now called The CLCTV), and Dan Sheehan and Thomas Cussins (partners in Ineffable Music), as well as concessions guru JG King and sound and light designer Bill Gaines of Bill Gaines Audio Inc., each of whom brings their own brand of expertise to the endeavor. They've teamed up to share in the risks and rewards, thoroughly cleaning the theater, installing a state-of-the-art sound system, removing some seats to make way for dancers (the venue used to have around 1,000 seats), and cleaning out a room behind stage right to create a greenroom for performers. Since hosting their first concert on Sept. 1, 2017, they've collectively brought in dozens of great acts in a wide variety of genres, serving beer and wine and great entertainment to thousands of people, with much more on the horizon. 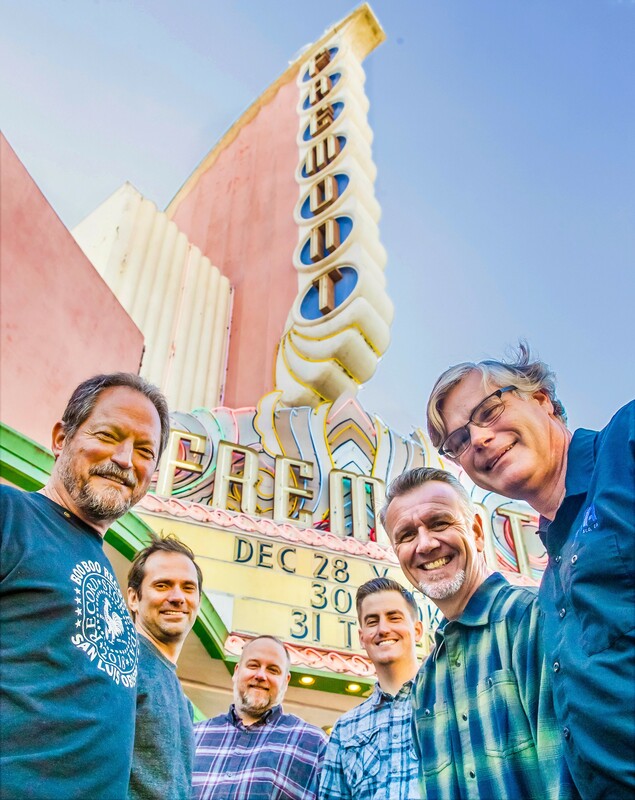 With a long-term lease and options for renewal, the Fremont Theater is here to stay, and it's become the premiere live music venue in Downtown SLO and a rival to venues such as the Performing Arts Center and Spanos Theatre on Cal Poly's campus. The various partners are energized and committed to making the Fremont a crown jewel of our community. Gaines got his start doing sound in the early '90s, working with Grateful Dead-like jam and cover bands Midnight Ryder and the Skydogs. He learned more working at The Music Factory and doing sound and lighting as a theater major in college. Mainly self-taught, he was soon doing Avila Beach Golf Resort shows with Howard and the Concerts in the Plaza series with the Downtown Association. ART DECO RAMA! 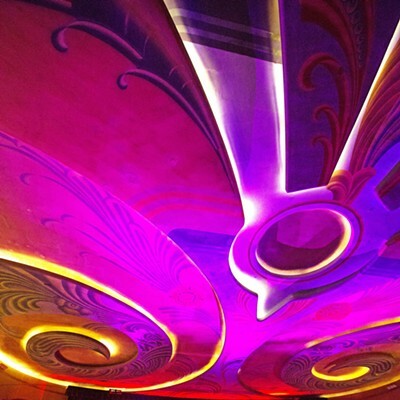 The ceiling and wall décor of the Fremont Theater creates a swirly, trippy vibe in the venue. "I've been doing Bruce's shows since the mid-'90s, so I've known him for a long time," Gaines said. "Mixing sound for Etta James at the Avila Beach Blues Festival was definitely an early highlight for me. I've done Concerts in the Plaza since the beginning—23 years now, I think." When Howard was looking for partners for the Fremont, bringing Gaines in seemed like a no-brainer. He had the expertise and access to the equipment, and he was the kind of guy you could call at the last minute to fix whatever needed fixing. "If Bonnie Raitt decides she wants spotlights even though it's daytime, I can call Bill at the last minute and there'll be spotlights," Howard said. 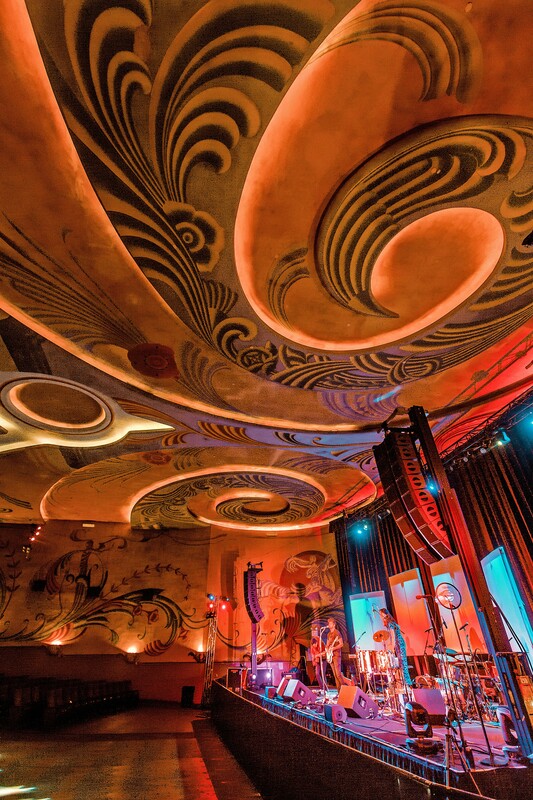 Gaines designed the L-Acoustics PA and lighting system, which has made the Fremont into a world-class venue. Gaines calls it "the nicest PA gear you can get," coupled with top-of-the-line mixing boards and microphone package. "I'm really proud of what we've done with the Fremont," Gaines said, though he misses being the only guy doing sound. "We've hired a couple of sound guys so I'm not there for every show, but my office is close by, so I'm the guy who gets up early in the morning to put bags on parking meters so the tour buses have a place to park." Has he ever had an act come in and express disappointment at the equipment? "Not once!" Gaines stated matter-of-factly. "Some acts come in and tell us they need more subwoofer for an EDM [electronic dance music] show, but they don't—there's so much headroom on that system there's plenty of sub." The room itself is acoustically superior by design. Gaines noted that when it was built in the '40s, there wasn't a lot of amplified sound, so paying attention to interior wall shapes made a difference. The high ceilings can cause some sound reflection, but a lot can be mitigated with the right technology. When it comes to concessions, JG King is a pro. He and his father John King ran the old Cigar Factory, This Ole House, The Spirit nightclub, as well as the six-restaurant chain, AJ Spurs, which they later sold. He also does concessions at the California Mid-State Fair and Vina Robles Amphitheatre, and he likes to keep it local. LET'S ALL GO TO THE LOBBY The spacious, colorful lobby has room for artists' merch tables, beer and wine vendors, and its classic snack bar serving up popcorn, candy, sodas, and often Woodstock's pizza. "I'm a fan of local beers. One night we might use Central Coast Brewing, another night Firestone," King said, adding that he likes to limit it to two beer choices—such as Firestone's 805 and Luponic Distortion—because it makes the line move faster. By the way, the Fremont Theater sells more Luponic Distortion than anywhere else, "which tells you the value of only having two choices," King laughed. The prices are in line for a concert venue—$8 for a pint of beer and $9 for a glass of local wine. "We certainly try to sell a good product at a fair price," King admitted. "I think they're fairly priced." He also brings in Woodstock's Pizza by the slice and Apple Farm sandwiches. These local favorites drive home the idea that the Fremont is a local gem run by people with ties to the area. "You and I both know how important the Fremont Theater is to SLO," King said. "It's been fun being a part of bringing it back to a place where people want to go." Is a hard alcohol license in the cards? "Maybe sometime down the line, but we're happy to stick to beer and wine for now," King said. In case you're interested, King says it's harder to clean up the popcorn than the beer and wine, and they also continue to offer beer and wine when they show movies. 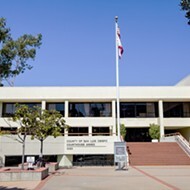 This week two holiday classics will be screened: Home Alone at 7 p.m. this Friday, Dec. 21, and Polar Express at 1 p.m. this Saturday, Dec. 22—both free admission, though you need to get tickets at fremontslo.com. 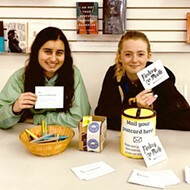 King's exploring the possibility of upgrading the theater to solar power and wants to install hydration stations so people can fill up reusable water containers, saying they want to make the theater "more green." "We still operate the old concession stand with popcorn, candy, and soda, but you'd be impressed by how many waters we sell," King added. The lobby is truly a gem, a classic throwback to old-time theaters. There's plenty of room for merchandise tables and mingling and mixing. It might seem counterproductive, risky, or even a recipe for disaster for three promoting entities to come together in partnership. After all, the concert promotion business is very competitive, and over the years Howard, Stevens, and Ineffable Music partners Sheehan and Cussins have probably bid on the same bands, but partnership has its benefits. Yes, they have to share the profits of their co-successes, but they also get to spread their losses when a show inevitably tanks. Instead of one promoter losing his shirt, several promoters merely lose a sleeve. CLASSIC MURALS Several years ago, local commercial art company Douglas Bouman & Associates spruced up the Fremont Theater interior murals, which Bouman's father helped paint originally. "We all bring something different to the table," Stevens explained. "We've all known each other a very long time and worked with each other, so we've created built-in trust. We all have our wheelhouse, our genre of music specialty." Stevens has a lot of connections in the EDM and DJ worlds, Sheehan and Cussins have the reggae and hip-hop side cornered, and Howard and his 40 years of experience has done it all but specializes in the Triple A genre (adult album alternative), the kind of music that does especially well in SLO County. "For sure, one of the keys is making sure all of us are communicating, which allows us to step over each other rather than on top," Stevens added. "We don't chase the same artists." To avoid conflict, the six partners hired a booking agent for the Fremont Theater, so instead of booking shows individually, they send their ideas to Casey Smith, who runs the calendar and books the shows, films, and special events such as weddings and parties. 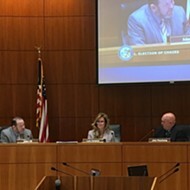 "What we want to do is provide an entertainment venue that's up to par with other similar markets in the country," Stevens said. 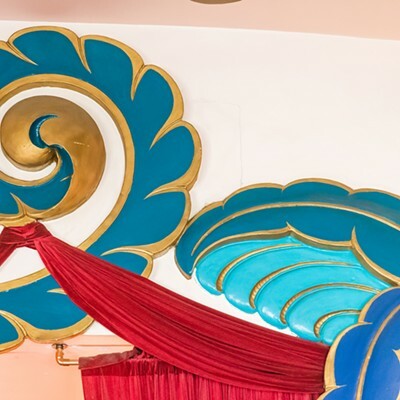 "This is a beautiful theater with close ties to the community, and we feel like we can provide the consistency and quality of shows, shows of the caliber of most big markets. "We want to make the live music scene as robust as everything else you get in San Luis Obispo, and that the venue is in the heart of downtown just adds to the story," Stevens continued. "I've seen artists walk into the room and their jaws drop. 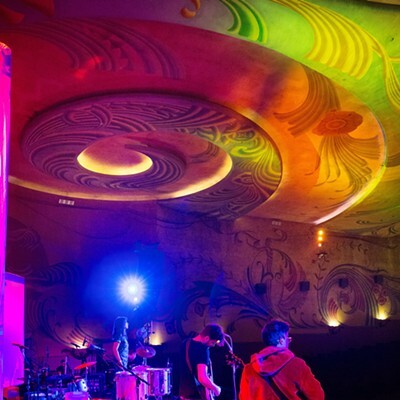 They go back to Nashville or wherever and spread the word that this little town in California has an unbelievably beautiful theater with state-of-the-art sound." To call Sheehan and Cussins "new" is a misnomer. Though they both reside north of us—Sheehan in Monterey and Cussins in the Bay Area—they've done a lot of shows in our market. "I've been working with Bruce Howard for years at Avila and before that at The Grad [The Graduate] shows," recalled Sheehan. 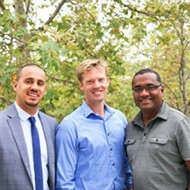 "With that long history of working together, we were excited at the opportunity to come be a part of the Fremont group. A partnership is like a marriage, and there are ups and downs, but everyone brings their own expertise to the table, and in this first 14 or 15 months, I'm proud of what we've accomplished, the improvements we've made to the venue, and the acts we've brought in." 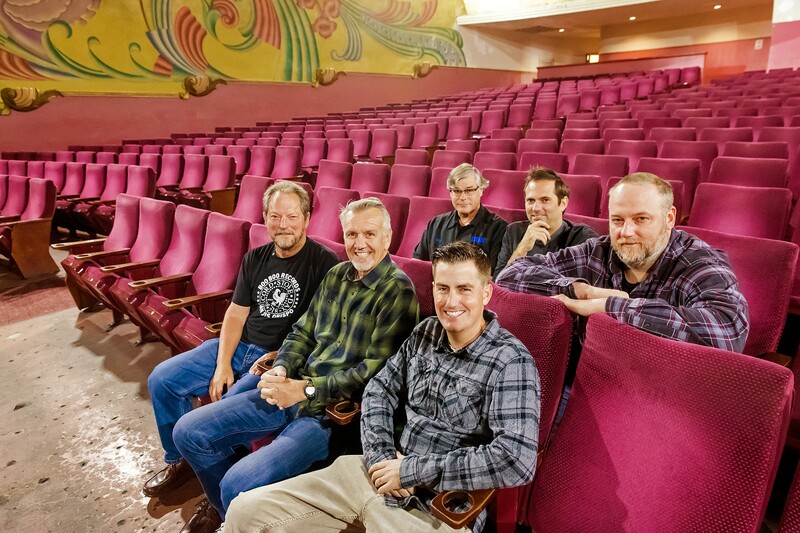 THE A-TEAM (Left to right) Bruce Howard, Taylor Stevens, Dan Sheehan Thomas Cussins, JG King, and Bill Gaines have joined forces to make the Fremont Theater into a world-class concert venue. Sheehan was initially wowed by the Fremont interior, but upon closer inspection, he admits one of his first thoughts was, "We've got a lot of work to do." Indeed, in many respects, the 76-year-old building is showing its age and in constant need of upkeep. It's got good bones, and the painted designs on the interior are well worth preserving. "Fortunately, we've been saving money to begin a complete repaint soon, which we're really looking forward to," Sheehan added. 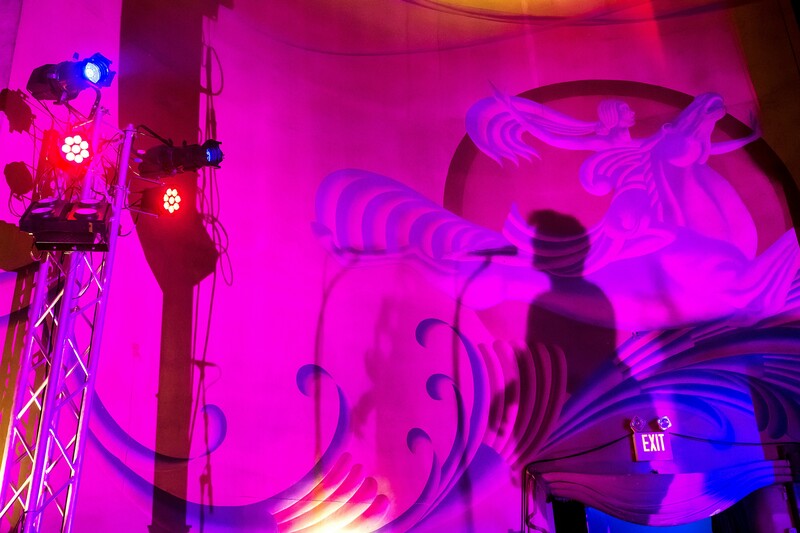 In addition to Ineffable Music, Cussins and Sheehan book The Catalyst in Santa Cruz, and Cussins manages bands such as Stick Figure, Citizen Cope, and Collie Buddz—all mainstays of our area. "I've always loved the SLO market, Pozo Saloon, and SLO Brew," Cussins said. "There's always a real special place in my heart for SLO, and our hope is for it to sustain the volume of shows you see in a secondary market like Santa Cruz. Our goal is to bring great, quality live entertainment to SLO. For me, my default fun activity is to see live music, and anything I can do to further that in SLO I'll do. One of the special things about our partnership is its goal isn't to make as much money as possible but to have as many great shows as possible." "This is a really strong group of partners," Sheehan added. "I don't think it's typical to have this strength of partnership where everyone wears a hat and has a specialty and strong range. It's definitely non-typical." Howard is without a doubt the nexus for this partnership. He's the common denominator among all the members. "Yeah, I would say the common connection is me and JG [King], who was the guy who called and said, 'Come back and look at the Fremont again,'" Howard said. 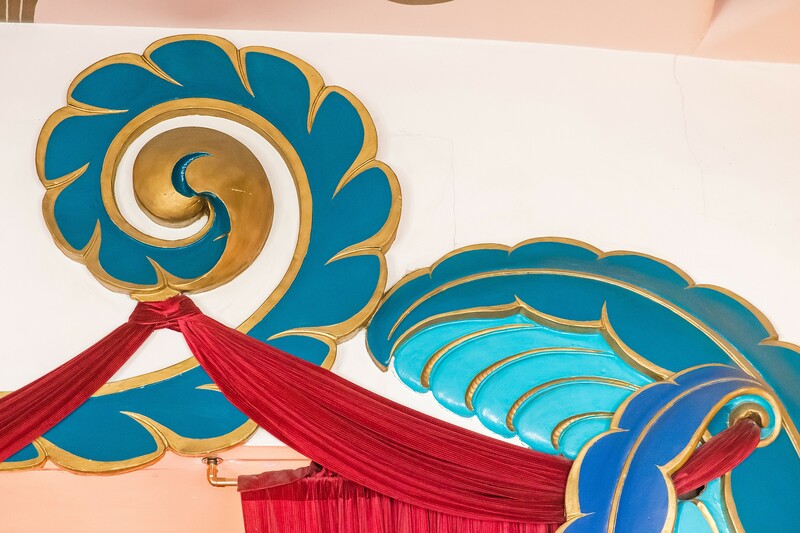 "He got me rethinking this old art deco theater, which every community has, and I looked at it again and said, 'Let me call some friends and see what happens.'" The Fremont is owned by developer Rob Rossi, who also owns the Avila Beach Golf Resort, where Howard has been holding concerts for decades. JG King's father, John King, also a developer, was a partner with Rossi in the Fremont until Rossi bought him out. It's a somewhat incestuous knot, but Rossi has such close ties to Howard and King that it made sense. 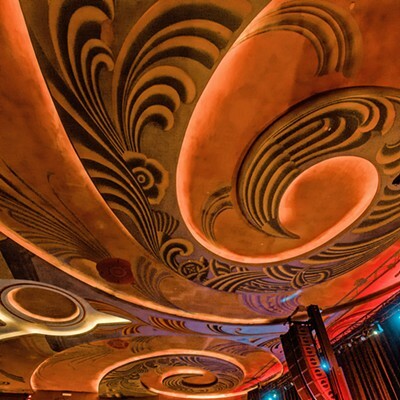 ALL IN THE DETAILS A thorough cleaning and some repainting has revived the majesty of the historic art deco theater. Though Taylor used to live in SLO and co-produce shows with Howard, he's since moved south and into other markets. Sheehan and Cussins do more shows up north. "My partners are more active in other markets," Howard said, "so it wasn't like I was bringing in my competition. And we brought in Casey Smith, who used to work for Paradigm—one of the top three talent agencies on the planet. We stole him with the good graces of Paradigm. Casey holds the calendar, so if we get an idea, we send it to Casey. 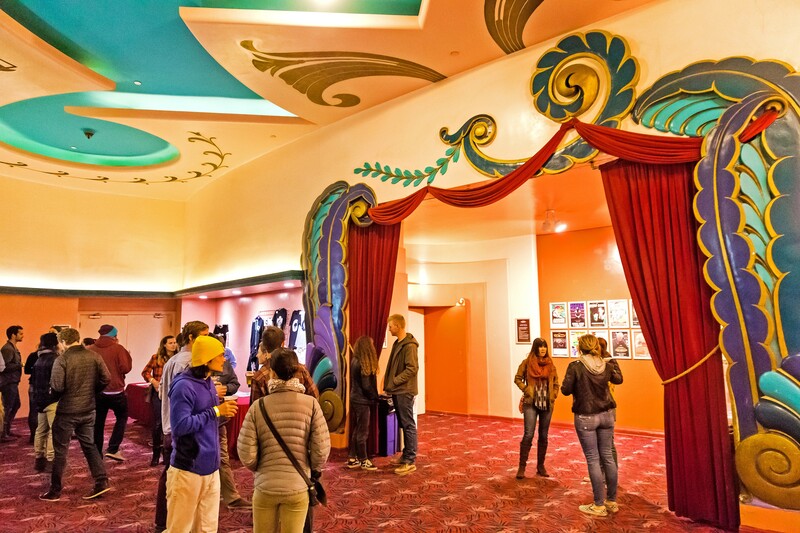 If Cal Poly Arts wants to rent the Fremont for a show, they talk to Casey. If someone wants to do a wedding, call Casey. How you control the calendar is really important—it needs to be centralized, so he knows if there's a first hold or a second hold on a date. If someone wants to know if Jan. 19 is open, Casey knows in an instant." Jennings Jacobsen, a former member of the Damon Castillo Band, is the venue's general manager, and all the partners are quick to praise his work running it. "These are old friends I've known a long time," Howard said. "Because I'm the grandpa in market, I've seen it evolve into a mature market for its size. 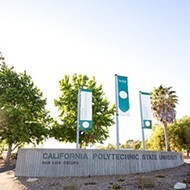 When I started there wasn't the PAC or Vina Robles or Chumash or SLO Brew Rock. I started doing little shows at Pozo, and my philosophy was never to pay more than $5,000 for talent or charge more than $12 for tickets.